Walt Disney Animation, along with co-directors Don Hall and Chris Williams, have taken inspiration from an obscure Marvel Comics title to build their own Asian fusion style cinematic world of heroes and wonder. Big Hero 6 is mostly an adorably pleasing animated hero's journey about relationships and adolescence set in a future amalgamated metropolis of San Fransokyo. The film remixes Japanese-American cultural influences in charming fashion with clever references to anime/manga. The crux of the film revolves around the relationship between Hiro (Ryan Potter) and Baymax (Scott Adsit), a boy and his robot. 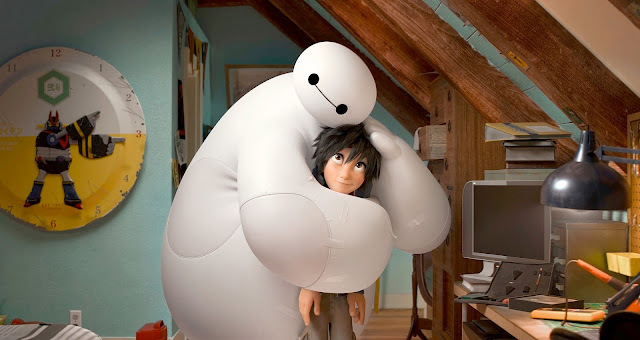 The dynamic and cuteness of Baymax allows for warmth between its characters. Taking inspiration from Pixar director Brad Bird's films and themes (think The Iron Giant meets The Incredibles) about friendship and family, Big Hero 6 becomes more and more of an overly conventional superhero origin story as it moves along to its inevitable team up. It's complete with childhood tragedy from a loner protagonist as he evolves and builds a team of sidekicks (through montage, of course) to overcome a mysterious villain. Big Hero 6 suffers from being overstuffed as it spends a lot of time teaching Hiro important lessons to get over his mourning and loss. Soon, it becomes a full on superhero epic with car chases, a battle with the big bad, and a greater nefarious plot involving inter-dimensional portals. These workmanlike developments are elevated by a diverse and talented voice cast featuring Daniel Henney, T.J. Miller, Jamie Chung, Damon Wayons Jr., Génesis Rodríguez, Alan Tudyk, and Maya Rudolph, who all balance the sweet and the absurd with welcome comic relief. It's hard not to be engrossed by the adorable qualities of Big Hero 6 and how it manufactures themes of grief and loneliness into its stunning, visual animation. All the superhero stuff, from building a team with super names and super suits to an inelegant Stan Lee cameo, diverge the warmer, moving elements and momentum of the film. By the final act, it fully takes on all the good and bad characteristics of a standard live action Marvel film remixed with the wonder of Disney and influence of Pixar.